Both the Post and the Times focus not on South Korea per se, but on Obama’s taking a “stern tone” toward North Korea in his discussions with the South Koreans. The Post suggests that the two sides have agreed to a “new approach,” which will reject “endless, inconclusive disarmament negotiations” with the North. OK, pardon me if I yawn. When George Bush senior visited Seoul as US president 20 years ago, things were simple – the US was the undisputed main ally and trade partner. Astonishingly, there was only one weekly flight from South Korea to China, the communist foe. 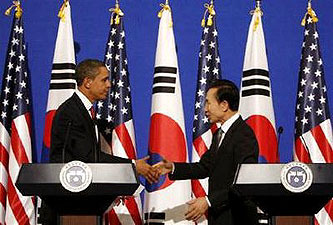 Barack Obama on Wednesday visits a South Korea where the US is no longer the only show in town. China is now the main trade partner, with 642 flights each week. One flight versus 642 flights — that’s a small detail that tells a large story about South Korea and China….There’s more, too, about Obama making trade promises to South Korea that Congress is unlikely to let him keep. All in all, you get in one-third the length three times more interesting information than in the Times and Post articles, and it’s epitomized in the lead paragraphs comparing the number of flights that now run weekly between China and South Korea. There are two things going on here. First, the FT writes for a more sophisticated audience that’s been following this story for a while and is actually interested in learning more about it. Second, and related, the FT doesn’t have to pretend that the only news that matters is whatever happens to be the current hot button in the United States. American audiences tend to believe that pretty much every international issue revolves mainly around how it affect the United States, and that’s the only angle they’re interested in. At least, that’s what American newspapers assume. They might find out different if they tried the FT’s approach, but honestly, they probably know their audience pretty well. Even most highly educated Americans just don’t care much about the rest of the world except to the extent that it affects us.